This image is an example of an opposing view. It is an image from the article Gun Control is DOA in Congress. The majority of the article centers around the fact that have control over the guns is a disturbance to the 2nd Amendment. The author of the article contends that rational individuals would be more suitable for guns and that gun control would not need to be needed. The author expounds on the fact that we cannot really determine the mental well-being of an individual because of the fact that at any moment minds can change. The author thinks that the laws that are in place are already strict enough. 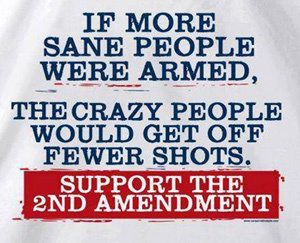 The author only supports making sure that we give guns to sane individuals. This is almost a contradiction to what he states first because he says who can actually measure the sanity of an individual being that it constantly changes. This is an opposing view in that the author almost asks that gun control not exist and that free reign be given for the purpose of gun use. The author doesn’t support the notion that guns cause violence. He rather supports the idea that it is all in the person at that time.